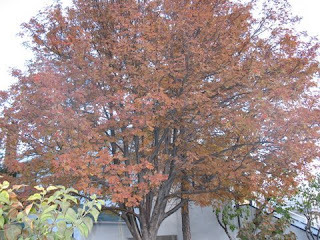 The mountain ash tree in our yard has been turning red for the past several days. It is such a striking image that I think I will write a poem about it. This is usually how poems come to me: through striking images that lend themselves to metaphoric thought. Since I have this blog, I would like to share with you the process that leads to a poem. I will try to update the blog along the way, so that you can see the versions of the poem as it evolves. The beauty of the ash tree holds out against the winter, and that holding out somehow intensifies that beauty, which climaxes just before it disappears.